On February 28, 2016 (Sunday), the phenomenal Kapamilya teleserye 'On The Wings Of Love' gave its last blow of romance as the reel to real life couple, James Reid and Nadine Lustre, have been interviewed for the first time after they revealed their real status as a couple. They were interviewed by another power couple the Kapamilya host Robi Domingo and volleyball superstar Gretchen Ho. The 'OTWOL: Achieved From Reel to Real' was to give tribute to the success of the said teleserye and to know more about JaDine. James and Nadine confessed their relationship on their concert last February 20 in JaDine in Love at the Smart Araneta Coliseum when James announced his love for his leading lady. In the interview, James revealed that no one knew, not even their stage director, that he will do such announcement. He just asked for an extra 10 seconds from their director before they wrapped up the concert and the rest is history. He even said that it felt liberating and free to announce their relationship because with his previous relationships, he needed to keep them secret. He said that it was satisfying. However, Nadine felt otherwise. She said it was her who preferred keeping their relationship private for awhile. When Robi and Gretchen asked the two how did they develop their romantic feelings toward each other, Nadine answered that though they really had seen each other only as 'bestfriends' and 'just a loveteam' before, everything was changed when they filmed the last few edisodes of OTWOL in Lake Tahoe. She said it was playful and they were able to entertain the potential of being more than just a loveteam. James also said that their courting stage was not the traditional way since they became friends prior to becoming a real couple they tend to know each other more. James also confessed that he was one who admitted his feeling first. 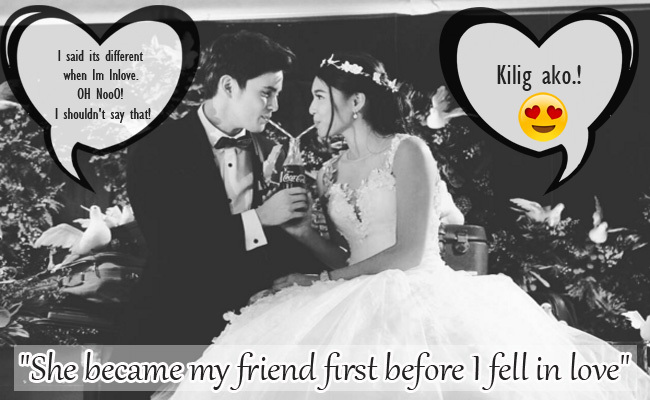 It was during a dinner date (if you call it so) when he accidentally admitted his feelings to Nadine. The cute part was when Nadine became speechless for a few minutes then eventually said, "Kilig ako" which was very evident because the two looked very romantic together! During the entire interview, James was holding Nadine's hands and smiling so wide you can feel the genuineness of everything. Despite the numerous bashing, JaDine is still savouring the success of their teleserye. In fact, JaDine will have a world tour this March and will also shoot their next movie. The OTWOL fever is really not over just yet!